Make calls that help save lives! Looking for a group opportunity that can help save lives? Teams of volunteers from your organization can help the Community Blood Center make calls to remind blood donors of appointments and notify previous donors of upcoming mobile drives in their community. There is a weekly demand of more than 2,000 units of blood for critically ill patients in our community. 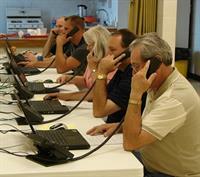 Calls made by Phone Bank Volunteers help increase donation turnout by at least 30%. We ask each volunteer in the group to commit to a minimum of 3 shifts and/or 10 hours of calling over the space of 6 or more months. Volunteer Drivers: Shift your Weekend into Volunteer Gear! Resolve to volunteer & make a difference in 2019!